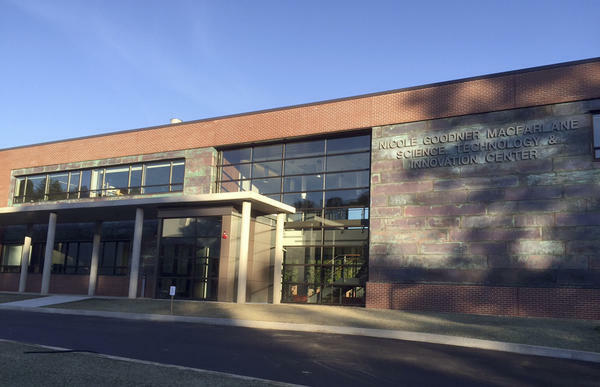 The Nicole Goodner MacFarlane Center at Landmark College shows the college's commitment to science, technology, engineering and math, they say. 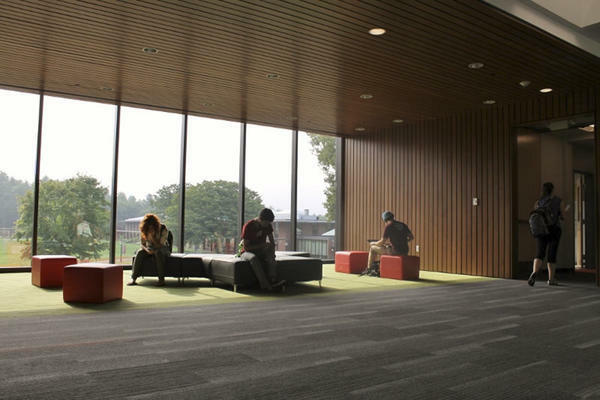 You can't miss the new Nicole Goodner MacFarlane Center when you enter Landmark College. The brand new 28,500 square-foot building dominates the view as you drive onto the Putney campus. Michelle Bower is chair of the mathematics and computer science department and she says the school's new science, technology, engineering and math, or STEM center, makes a statement about Landmark's focus on research and science. "What I think it says about the institution and about our students is that we believe that they have a lot of options," Bower said. "I think that it's a demonstrated commitment of the institution to the field and to our students. It's the first thing you see when you come to campus, so it's front and center." Gov. Peter Shumlin will be on hand Saturday when Landmark College officially opens its new $9.6 million science, technology and innovation center. The opening is being held as Landmark College also celebrates its 30th anniversary. Landmark College offers specialized programming for students with learning disabilities. The new STEM center, which is the first new academic building added to the campus since the school opened 30 years ago, includes four science labs, two computer classrooms and 12 faculty offices. The labs are stocked with modern science and computer equipment and the rooms and halls are designed to encourage Landmark students to take risks they might otherwise shy away from in other labs. Landmark traditionally offered two-year associate's degrees and began offering four-year bachelor's degrees in 2012. Landmark College president Peter Eden says the new building will allow the school to continue growing its programs. "This fall we started a bachelor of science and computer science, so we've moved into STEM offerings and we needed to support those with the right learning environments and research environments. So we simply had to create a better facility to support these strategic programs our students want and need." The MacFarlane Center also houses the Landmark College Institute for Research and Training, which receives National Science Foundation grants to do research on learning disability education. Eden says the building was designed to bring the research center closer to the college classrooms and labs. Copyright 2015 WVPS-FM. To see more, visit http://www.vpr.net. Under current law, by the time students in this year’s sixth grade class reach 12th grade, there will be new, more rigorous requirements to graduate high school. The University of Connecticut has broken ground for a new $95 million engineering and science building. Gov. Dannel Malloy joined UConn president Susan Herbst and other dignitaries for the Wednesday ceremony at the site of the planned 118,000-square-foot building. It is designed to house laboratories for UConn's genomics, biomedical, chemical engineering, and cyber system research programs.